Effective immediately, there will be changes to our Food Pantry availability. Details on our Food Pantry changes beginning February 2015 are below or can be downloaded here. 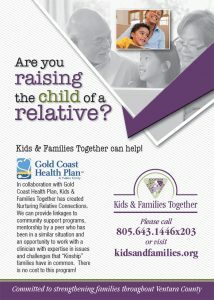 Please call our Kids and Families Together office if you have any further questions or concerns at 805-643-1446. Thank you for your patience and understanding. Kids & Families Together clients will now be able to shop at the pantry only 1 Tuesday a month for Pantry. Clients have the option to get USDA only food items 1 additional Tuesday a month. Clients may apply at the Project Understanding Intake office (located at 819 Thompson Blvd, Ventura) for an additional Pantry voucher, but must qualify under the Project Understanding requirements to receive a pantry voucher. Project Understanding Pantry vouchers maybe used on Tuesdays or any of the Project Understanding pantry days. Proof of dependents – ID cards, medical cards, guardianship letter or adoption paperwork. Social security cards for all members in household. We apologize for any inconvenience this may cause you and your family. If you have any questions, please feel free to contact the Project Understanding Pantry Manager or your Kids & Families Together case worker. Thank you.